It is the intent of the Iowa Concrete Paving Association (ICPA) to assist in the development of future construction management for the highway construction industry in Iowa by providing scholarships to Civil and Construction Engineering and/or Construction Management students at Iowa State University (ISU), the University of Iowa (U of I), and the University of Northern Iowa (UNI). 1. 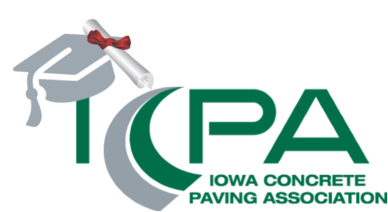 The amount and number of scholarship awards will be determined annually by the Executive Committee of the Iowa Concrete Paving Association. In 2018, the association awarded seven scholarships ranging from $1,000 to $2,500. 2. Awards will be open to students with a sophomore status or higher majoring in Civil or Construction Engineering at ISU and U of I, and Construction Management at UNI. 3. Selection of the scholarship recipient(s) will be made by the Executive Committee of the Iowa Concrete Paving Association. Applicants who are immediate relatives of this committee and students who have previously received an ICPA Scholarship are not eligible for an award. 4. Selection of the scholarship recipient(s) will be based on scholarship need, civil or construction engineering experience, an intent to enter the construction field in Iowa, and other criteria. Preference will be given to residents of Iowa and the adjoining states. 5. Scholarship recipient(s) will be recognized at the ICPA Annual Concrete Paving Workshop Awards Banquet to be held in February 2019. ​6. Additional information on the scholarship opportunity may be obtained by contacting the ICPA office at dking@concretestate.org or 515-963-0606.